Among all the hoopla of the desktop Mac refreshes this morning, we missed the minuscule MacBook Pro update. The higher-end 15-inch model, you know, the $2500 one, got a processor bump from 2.53GHz to 2.66GHz. And a 256GB SSD for a whopping $750. Not good enough for you, huh? How about a $300 bump to a 2.93GHz processor? 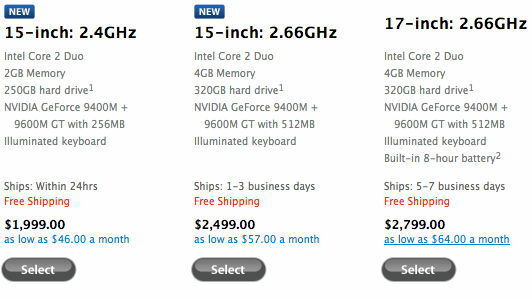 In case you haven’t caught on, that puts the high-end 15-inch model on par with the 17-inch MBP except the latter can take up to 8GB of RAM. Anyone buy the 15-inch model recently?